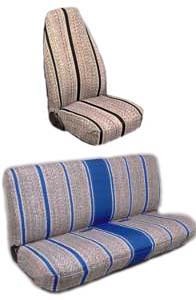 The Saddle Blanket seat cover is very sturdy, rugged, and durable. This seat cover can come with front pockets, if requested, that give you extra storage space. They are great for those work trucks and heavy-use vehicles. Material is made out of the heaviest woven cloth on the market. These seat covers feature all cloth (no vinyl) material, so you won't have to worry about the cover cracking in cold temperatures. The seat covers can be removed and washed (Try that with your seat! ).